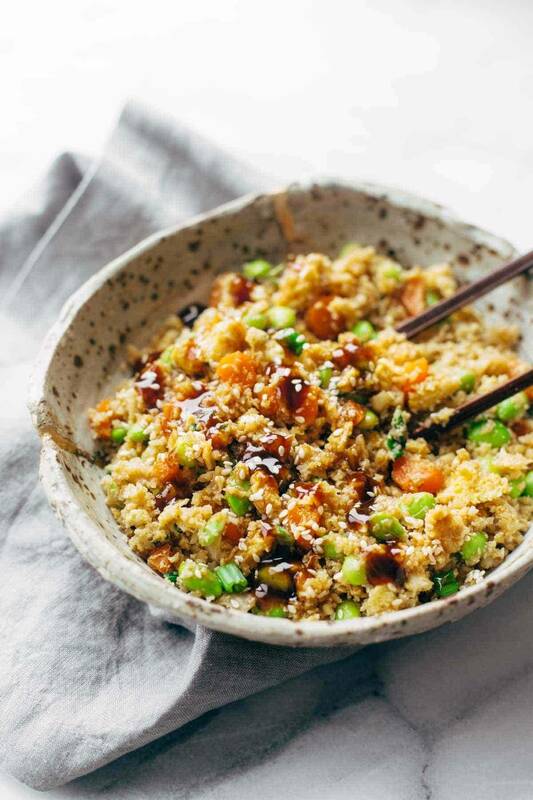 Cauliflower Fried Rice is a healthy + clean take on fried rice made with cauliflower, carrots, onions, garlic, eggs/tofu, and sesame oil. Yum yum yummmm. Cauliflower Fried Rice. We are getting that ultra-hip today. Because sometimes life is life, and you just gotta keep the food really simple. And super healthy. And deliciously delicious. Like when you come back from vacation on a Monday and you realize, on Friday, that it actually just takes you twice as long to recover from your trip-scapades than the amount of time you actually spent tripping. Is that a win or a fail? Don’t answer that. Or like when you bought a bunch of ingredients to make really awesomely creative and powerhouse nutritious food for the week, but then it becomes the end of the week and you open the fridge and all your good ingredients are still staring you back in the face while your empty cereal boxes are telling the hard truth about your real life. Or like when you try to wake up in the morning but bed – oh that sweet loving BED – it’s so warm and so comfy and it calls you back in for roughly 50 million alarm snoozes. Honestly, sometimes I just try to think about what life is like for you amazingly adult heroes with the little ones, you people who wake up all night and then early in the morning and have to be a functioning person in the world who is responsible for a job, a house, and the safety and well-being of your tiny humans, and I just get 200% overwhelmed. Please tell me – what is your secret? Are you all just so very good at hiding your lack of sleep? Have you developed super powers? How are you even alive? ALL HAIL THE PARENTS. 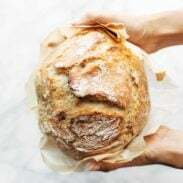 So all that to say, this week I am making Simple, Healthy, and Delicious completely non-negotiable in my back-to-it cooking routines, and I’m guessing you might be looking for some of the same. Because LIFE, man. And that works out nicely because it’s exactly what we have going on today. 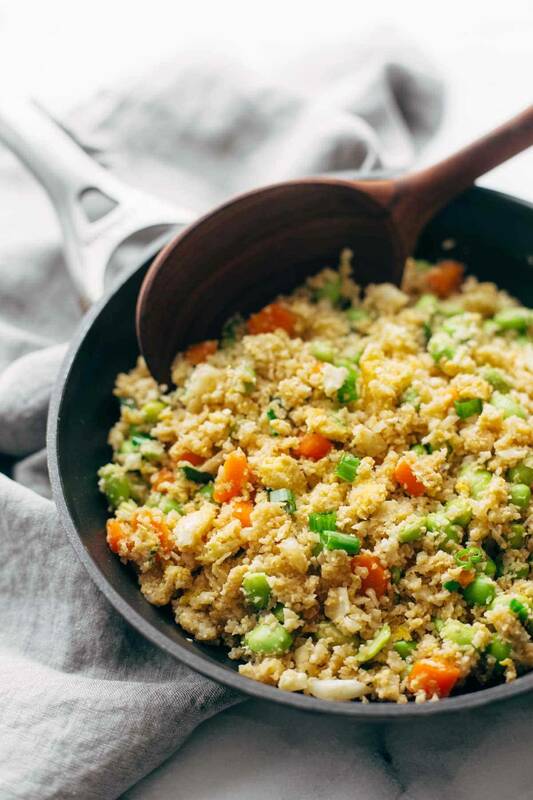 15 Minute Cauliflower Fried Rice is loaded with veggies and protein (eggs or tofu, maybs?) and it is drizzled with a little somethin extra (soy sauce, hoisin glaze, take your pick) and it is, in fact, simple, healthy, deliciously delicious. Guys, have you ever heard of this cauliflower rice thingy? It’s pretty obnoxious at first glance (why not just make RICE? does everything have to be made from cauliflower?) but upon further investigation and much cauliflower rice consumption, I can confidently say that this is worth the weirdo factor. Just think about how healthy this is. Seriously. It’s just straight up vegetables, with a little oil, a little sauce, and a little egg or tofu for protein. Cleanest of the clean. Also – it’s so fast and easy. Just pulse the raw cauliflower into “rice” in the food processor and then stir fry the whole thing up. No soaking, no pressing, no strange and unusual kitchen moves other than just pulsing a few pieces of cauliflower into this magical rice substitute. This recipe is too easy for you to even have any excuses. Get all your ingredients out (a little mise en place, maybe? #fancy) and I promise it won’t take you more than 15-ish minutes. Dinner! Ready! Set! Go! Update: Check out my new MEAL PREP cauliflower fried rice, complete with theeee best crispy baked tofu! 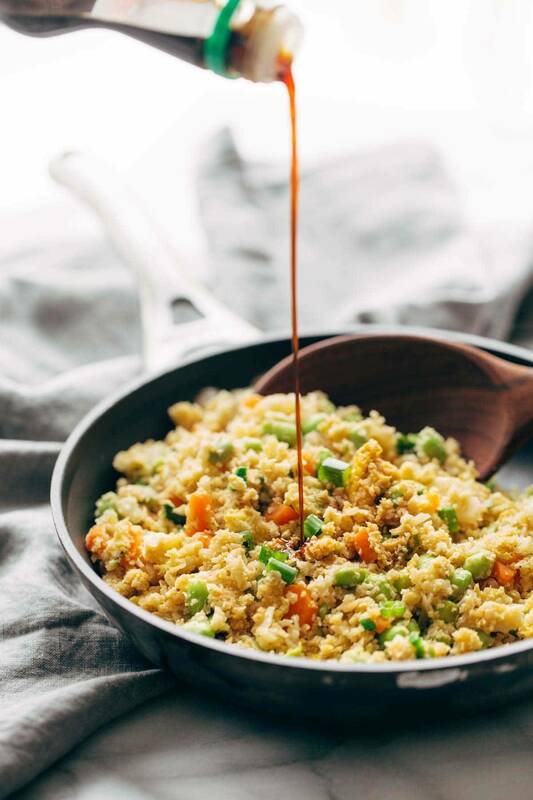 15 Minute Cauliflower Fried Rice – healthy + clean fried rice made with cauliflower, carrots, onions, garlic, eggs/tofu, and sesame oil! Vegetarian / vegan / gluten free. PREP CAULIFLOWER: Shred cauliflower using the largest side of a grater OR by just pulsing some rough cut pieces in a food processor; the end product should resemble smallish grains of rice. This recipe tastes best the same day, in my opinion. The cauliflower just gets so overly cauliflower-smelling when you have it as leftovers. For the sauce on top, I just whisked equal parts soy sauce, honey, sesame oil, and oyster sauce together and drizzled it over top with sesame seeds. I like a little pretty flair like that. Spicy Fish Taco Bowls with Cilantro Lime SlawMeet Jenna: Pinch of Yum’s New Office Manager! I just got back from 2 weeks of eating ALL the things in Mexico and my body is basically YELLING at the screen because it wants this fresh, fast and HEALTHY little cauliflower fried rice goodness for dinner. All the veggies, all the easyness! GIMME! Pinned! Maybe the cauliflower-everything trend is obnoxious, but I kinda love it. Cauliflower was underrated for way too long, so I’m glad it gets some love. This looks deeeeelicious. This looks absolutely delicious! I am a huge cauliflower fan and I love seeing it incorporated into meals in unique ways. Also, as a reader, I really appreciate how you include the nutritional information of your recipes. Those details definitely don’t go unnoticed! Thanks! It’s called coffee… parents survive only by drinking lots and lots of coffee. Still not a huge fan of cauliflower do to annoying pregnancy aversions, but I might have to give this one a try! This is exactly what I need today! Super quick & simple but healthy and delicious at the same time. No need to resort to frozen pizza (although sometimes I really want to, lol). haha, I love your sleep deprivation rant, parents are my heroes. I’m so bad at hiding my lack of sleep, the only thing that ever works is a big amount of stress (though I wouldn’t recommend it to anyone). I think I might finally have a way to use cauliflower that my wife won’t say yuck! I will let you know. Looks super too! It’s a great way to eat Cauliflower, never tried it with cheese before. Will be sure to use it again. It’s nice to see that you are showing the Nutrition Facts for the recipe, wish everyone did it. How do you work it out? I just made this myself this week… So good. Here is a great tip: Trader Joe’s now carries FRESH riced cauliflower in the produce section! I haven’t made this yet, but I did find the riced cauliflower in Grocery Outlet. The recipe author is correct about leftovers. I adored this recipe the first day but noticed the leftover rice had absorbed too much moisture. Yuck! So I hope that riced cauliflower in store is not full of moisture. In fact when made with rice it’s best to dry the rice out a bit and even let sit in frig overnight to avoid a sticky mess. I am SO hooked on cauliflower rice. I switched over a few months ago and have not make actual rice since! Mine always ends up being of the cilantro-lime variety to go with a fish taco bowl or anything Mexican really. YUM. Also, I am trying to work your April 9/10 workshop into my schedule. Crossing my fingers I can make it work! I love that idea Ellie! And also would love to have you at the workshop! The studio space is looking better and better every day – we will have TONS of practice space/ props / windows for peeps to use and it would be awesome to have you here! What a great low carb and high protein recipe! Fried rice used to be such a huge staple in my house. This looks even better! The pictures are awesome!! Definitely tempted to try this dish. This looks so much better than those sparse cauliflower rices that are served raw for some nutritionally dubious reason. I’ve always avoided making cauliflower rice because it seemed like too much work. Looks like I was wrong. Big fan of cauliflower rice here – and fried rice without carb guilt = happy dinner. BTW, your vacay Snapchats were da bomb. Aerial yoga – who knew! I am relatively new to your site and I just have to say how much I love reading your posts! You are top dog hilarious and engaging! Love it! 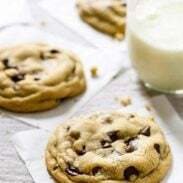 Thanks for all of the yum recipes! They are amazing!! Thanks for reminding me about cauliflower rice! This looks like an awesome take on it. I am totally afraid of becoming a parent and having to function on tiny amounts of sleep. How do people do it?? I don’t even know. SCARY. “…it actually just takes you twice as long to recover from your trip-scapades than the amount of time you actually spent tripping. Is that a win or a fail?” <- I don’t know whether it’s a win or fail, but it’s life for me! Can’t wait to see your photos from the trip! Haha thanks Abbie! Appreciate that! Ok. Now I’m HUNGRY! This looks awesome! I’ll give it a whirl tonight. BTW: I love your style of writing. This is a perfect example of a fast, healthy and delicious meal. It is frustrating sometimes how people really dismiss the idea that this combo is achievable. Thank you so much for the inspiration. Delicious, healthy, and easy to make? There really are no excuses! Ohhhh yes! I need something just like this to help balance out all of the Valentine’s Day goodies! This looks soso delicious, Lindsay! I like how you make healthy food look so delicious! I make this all the time! I love it! I have a 17-month old sweet boy and the only way to not go completely bonkers is to go to bed pretty much right after he does. Sleep when they sleep is truly the golden rule! And coffee…and sometimes chocolate. I’m going to be starting The Bone Broth Diet next week and cauliflower rice is one of the suggested recipes!